They’re bringing limelight to women-led movements resisting land grabs and destruction from mining companies, hydroelectric plants, and monoculture plantations. The bus pulls into a dusty vacant lot off the road. A red tarp has been strung over a few rows of folding chairs. Although there’s still a morning chill, the sun will soon be fierce in the eastern Guatemalan village of Casillas. Small groups of locals wait nervously as 30 women file off the bus, among them four Nobel Peace Prize winners. That’s the idea. Women peace-prize laureates founded the Nobel Women’s Initiative in 2006 to bring the limelight to local women-led movements in places like this, where under-the-radar conflicts kill more people than formal wars. 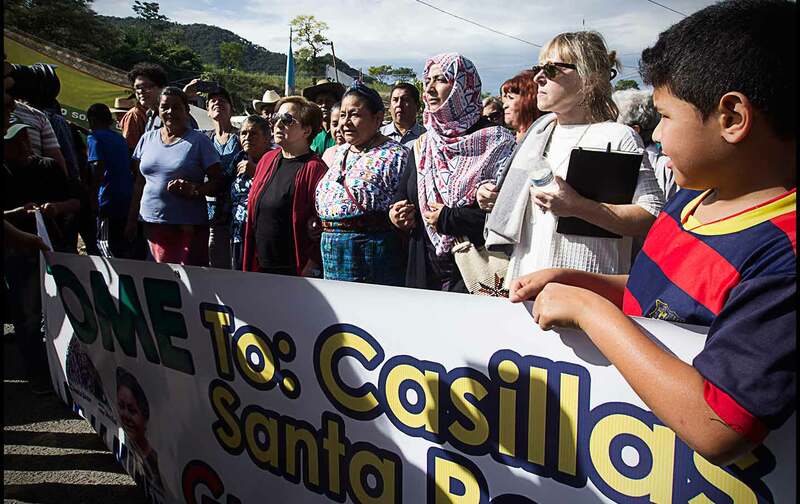 In late October, the Nobel laureates traveled through Honduras and Guatemala with a group of women activists and journalists to look at the vital but perilous intersection of women, land and peace. For eight days, we listened to the stories of women like Amalia who have dedicated their lives to stopping land grabs and destruction from mining companies, hydroelectric plants, monoculture plantations, and other megaprojects. “Land will continue to be the most serious problem in Guatemala and the rest of Central America in the coming years, and it causes the most conflict throughout Latin America,” laureate Rigoberta Menchú explained. Menchú was awarded the peace prize in 1992, in the midst of war in Guatemala. The biggest difference between the violence of the past and the violence today, she said—20 years after the peace accords—is that today’s resistance is nonviolent. The offensive against indigenous lands and territory, however, is not. Honduran and Guatemalan women describe assassinations, imprisonment, threats, and beatings from companies and the state forces they work with. Faced with a new wave of intense pressure from transnational corporations, they’ve joined, and in many cases led, the defense of their communities from some of the most powerful economic interests in world. After being declared “Open for Business” following the 2009 coup d’état, Honduras is now the most dangerous place in the world for environmental activists, with more than 120 land defenders assassinated since 2010. Community displacement and disruption, along with compromised justice systems, have given these two nations some of the highest homicide rates, and especially femicide rates, in the world. The wholesale granting of private mining concessions—307 at last count in Guatemala, and some 35 percent of Honduran national territory—sows conflict between corporations and local communities for generations to come. In these two countries plagued by violence and injustice, recognizing the urgency is only half the purpose; the Nobelists have also come to honor the agency. “Here we’re not just supporting women who’ve suffered, women who’ve been raped in some cases. We’re here to support women leaders—women who organize their communities, who organize food supplies, who organize to free political prisoners, women who tirelessly speak out,” Menchú stated. At each stop, they affirm the role of women in an epic battle playing out around the world on hidden stages like this, one that will define our collective future in even more profound ways than the machinations of the rich white men in power. These four women know what women’s leadership implies and the risks it entails. Each one is a consummate grassroots organizer who gained international recognition not by working the upper echelons of international diplomacy, but in the streets and town plazas of their home countries. Karman, a journalist, led marches to defend freedom of speech and democracy and became the public face of the Yemeni uprising. Iranian Shirin Ebadi is a lawyer and champion of women and children’s rights, with a keen eye for strategies that combine advocacy and legal challenges with targeted public campaigns. Jody Williams built an international movement to ban landmines, and after succeeding in that struggle, continued a lifelong commitment to nonviolent grassroots organizing. Rigoberta Menchú, a Maya K’iche’, has promoted indigenous, feminist, and environmental rights for four decades. Not one of these four women has altered her commitment since walking the red carpet. Not one has chosen the human-rights cocktail circuit over the gritty work that the Honduran and Guatemalan women do every day. So there’s no ice to break as they’re greeted by the Xinca people of Casillas. The residents around the mine have set up rotating shifts in a peaceful resistance action that blocks the only access road to mining-company vehicles, while leaving it open to everyone else. Popular consultations held in eight surrounding towns revealed that more than 95 percent of the population opposes the Escobal mine, owned by the Canadian firm Tahoe Resources. The Xinca have the internationally recognized right to a binding consultation, but the mine, with support from the Guatemalan courts and government, continues to operate. As the meeting ends, the news arrives that the mining company’s propaganda department has put out a television spot. It begins by welcoming the Nobel women, featuring floating photos of the four laureates in various Nobel settings. A sonorous male voice then thanks them for coming to Santa Rosa to “mediate” the conflict caused by “a small group of community members who are blocking the public road.” The delegation is outraged at the manipulation and prepares a response, but the incident proves that the Nobel image is powerful enough for the corporations to think they have to co-opt it. Just days before meeting with the women of Guatemala, we visited another remote corner of the world where a terrible crime focused international attention on the price of women’s defense of land. La Esperanza (hope) is the town where land defender Berta Cáceres was assassinated on March 2, 2016, and Utopia is where the organization she founded continues her work. In light of her murder at the hands of hit men linked to Desarrollos Energéticos Sociedad Anónima (DESA), the company holding the dam concession, and the Honduran government, the names could seem like a cruel joke, but they reflect a vision the bullets couldn’t kill. Days later, an independent group of international experts released a report on the murder, exposing a premeditated plot by DESA and government security forces and a subsequent cover-up by the Honduran justice system. The report received worldwide attention and put pressure on the government of Juan Orlando Hernández to hand over information withheld and punish the murderers. The Nobel women and the tour’s co-organizer, Just Associates, have supported the case since the beginning and have pledged to build the international call for justice. At a press conference in Tegucigalpa, Shirin Ebadi joined Honduran organizations in demanding that the investigation go beyond the arrest of those who pulled the trigger. “These people received orders to assassinate her and it’s very important that we find out who was behind this murder,” Ebadi, a former judge, remarked. The Honduran defenders told us that assassination is just one of the ways the government and economic elite silence women land defenders. Militarization of territory under the pretense of the war on drugs creates a permanent intimidating force, and, increasingly, the government has been criminalizing activists. When I was a kid, if you said you wanted to win the Nobel Peace Prize when you grew up, it was a half-joking way to refer to some remote pinnacle of human success. We never thought of it as actually dedicating your life to building world peace, mainly because we had no idea what Nobel Peace Prize winners really do. For these four, the prize is not the pinnacle—and the work is what it has always been about anyway. One way to protect and strengthen women’s voices in defense of rights, land, and peace is to pass them the Nobel mic. An entourage of national press follows the laureates—often the same media that routinely ignore or malign women’s movements every other day of the year. With the spotlight on the laureates, those media are forced to relay the voices from below. Subversive messages emerge. They crack through the carefully crafted corporate lines that attack the opposition, hide the damage to earth and communities, and promote a worn-out promise that progress lies in stripping natural resources as quickly as possible. For the women activists, seeing themselves through the eyes of these internationally famous peacemakers makes them the heroes of their own stories. That’s the basic principle at work here—that when it gets right down it, these small stories and these local heroes are the true building blocks of world peace.